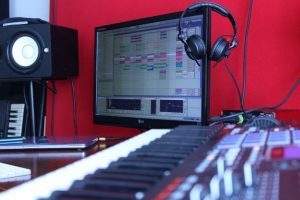 The studio is a music producer’s temple and to get the most out of it you not only need it to be top tier in terms of technical capabilities and sound quality, you also need to consider how the vibe you set through habits, layout, and design affects your mindset, creativity, and workflow in the studio. 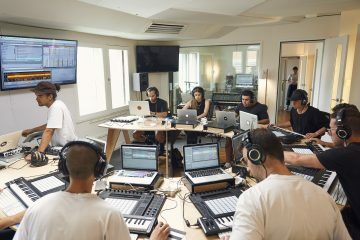 Read on as we speak with Ableton producers and explore how to set up your music production studio, home or professional, to get the most out of every session you complete. It always pays not to cheap out when purchasing new speakers. The only way you can improve what you’re creating is to evaluate it through your hearing. The speakers you use dictate what you hear – leading you to decide whether to up the bass or tone things down and if your speakers don’t portray your sounds accurately, you won’t be able to hear the problems in your mix. All good studio monitors should reproduce sounds as flatly across the audio frequency spectrum as possible. Commercial speakers in clubs might boost bass, and give music that extra punch but studio monitors shouldn’t favour lows, mids, or highs any more than the other. So when it comes to selecting the right monitors for your music production, we only have a few words of advice – get the best product your budget can afford you, understand how to use them properly, get to know them inside out, and treat them with all the TLC they deserve. Designing the layout of your studio is a pretty personal thing. 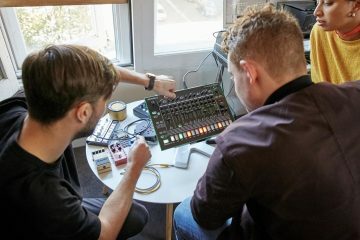 There are a few simple things you can change that will affect the quality of sound in the room, dictating how you hear what you’re creating, and the changes you make to it. 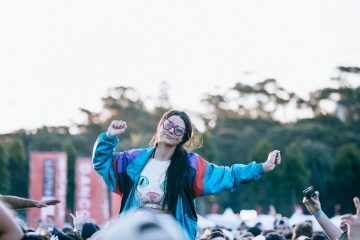 Sydney producer Taka Perry produces and mixes tracks for artists like Mallrat, LANKS, Ruel, Max Frost, Oriental Cravings as well as working on corporate music projects for his creative agency, Mude. To contribute to the conversation, he told us his tips and tricks for laying out your furniture and equipment in ways that encourage the best listening experience. And as you’ll learn – bass frequencies are what you want to keep an eye on maximising. Take note – even if your studio sounds amazing, it means nothing if it doesn’t inspire you and the people you work with to create something incredible. Fill your studio with art, books, trinkets, and all in all, things that inspire happiness and creativity. “I’d say the most important thing is that your studio has a vibe, both for you and others. Make it look nice, put some reed diffusers in so it doesn’t smell like man-sweat, get some IKEA artificial plants, string up some lights,” says Taka. If your studio is in your bedroom, like electronic-pop artist Bajillionaire (IRL: Charlie Hole), you’ll need to put in the work to keep yourself focused. “Stuff like keeping your phone away from your desk, staying off social media, and making lists are all basic things we can all do to improve our workflow. There’s also smaller stuff like getting fully dressed regardless of what I’m doing, having 3 full meals every day, and forcing myself to work on ideas for a minimum of an hour at a time has made my workflow much smoother,” says Charlie. Laying out your equipment to maximise your workflow will stop you from losing that great idea because you had to go digging through a box of tangled cables. “There have been so many times when I get an idea where I need to link up different parts of equipment, so I went to Bunnings and bought a bunch of wall hooks, and organised all my cables on the wall by input type, so that if I need something ASAP, I don’t have to go find it tucked away in some random box – everything is accessible and organised,” says Taka. If you have the budget for it, consider getting a second computer monitor. This way, you have more space to spread your workflow across. With Ableton, you can have your session view on one screen and arrangement view on the other! 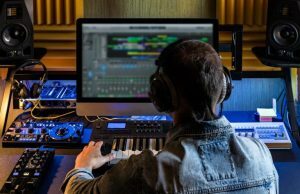 Use your DAW to the best of your abilities – and in the case of Ableton Live, there are built-in features that can help speed up your production process. “Being able to group and save Instrument Racks, with sounds already processed and ready to be dropped into any idea, has allowed me to start ideas so much quicker! I can pull in my favourite patches and instruments super easily, and not have to spend tons of time at the start of an idea trying to find new sounds,” says Charlie. Let’s face it – whether you’re working on large-scale projects, or just make music for the love of it, you’ll be spending a whole lot of time sitting at your desk. So, both the vessel you sit on, and whatever holds your production equipment should be considered when creating or revamping your studio. Again, the product features that would be considered best will depend on your practice – and you can use some common sense here. Tracking a bunch of live guitars? Probably best not to go for a chair with armrests. Got more equipment than you can keep track of? You’ll need more desk space than the average Joe. But there are a few things that all home studio owners should consider when it comes to ergonomics. This will dictate whether or not you’ll leave your back crying for help when a long session is over. When it comes to where you choose to plonk yourself, first consider the answer to: “Will I still feel comfortable in this chair after 10 hours of staring at a screen?” And at the very least, find a chair with proper lower back support and decent cushioning. Even after the selection of your new seating vessel, keep an eye on your posture. A good chair still won’t save you if you spend those 10 hours hunched over with your nose touching the screen. Your desk and the placement of your computer screen is just as important. Make sure the top of your screen is just below or at eye level, so that you won’t find yourself tilting your neck down endlessly. Get a laptop stand, or safely elevate your computer screen with whatever you can find. Choose a desk that your forearms can rest on at a 90-degree angle, so your wrists aren’t tilted in strange directions for long periods of time. Somehow, it’s not surprising that a dose of fresh air, sunlight, and new surroundings can help itch that creative scratch. More importantly, trying to do something that doesn’t involve music. Go for a walk, hit the gym, get a coffee with a mate, or do something you haven’t done before to lift you out of the creative slump and return to your to-be masterpiece with a fresh set of ears. If you’re stuck for ideas, it also might just be your option paralysis. “Try limiting yourself – say, you make something just using piano, remix a track you love, or base a song off one sample,” says Taka. “Not everything you make will be a dope song, but you have to make the not so great ones to come across the great ones. So just roll with it, keep working on it, and don’t sabotage your ideas so quickly,” he adds. So even if you’re not looking to completely refurbish your studio, try taking 15 minutes today to switch things up, see what different setups might improve your workflow, and see where it takes you and your music. 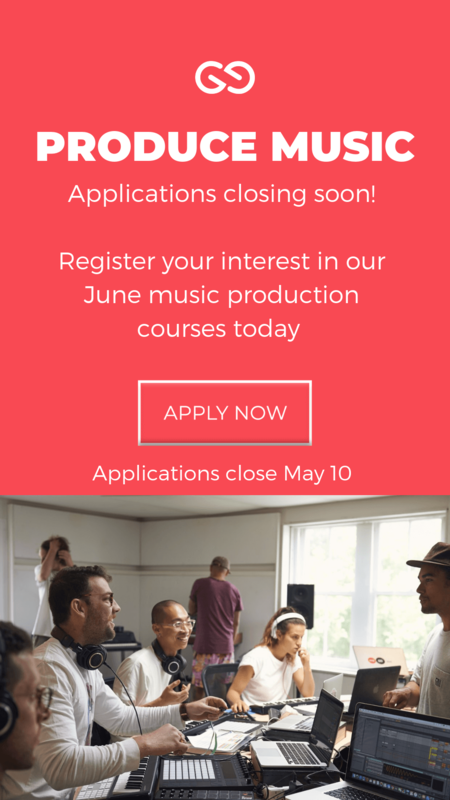 Considering starting out or upping your music production skills? Be sure to check out our ‘Produce Music’ course here!